I’ve seen this done a couple of times on random blogs now and thought it was a nice idea. 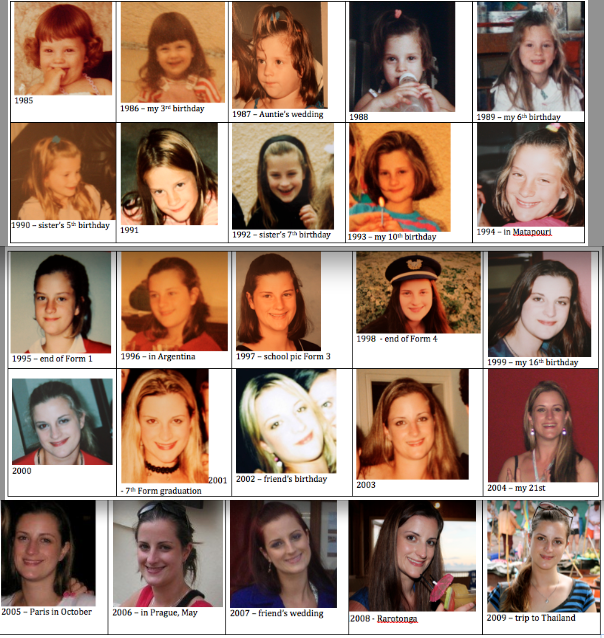 So I hereby present you with the evolution of me – one photo per year of my life to date. For the ones I know or remember I’ve included a note of where I was when the photo was taken. Looking back at my life like this several questions come to my mind. For example, what my parents doing with my hair from ’85 – ’87? I look quite happy from ’90 – ’94 which surprisingly correlates to the time when Mum would put her Enya tapes on for pretty much every car trip we took. Sometimes we’d even get Phil Collins or the Alan Parsons Project, but I associated Orinoco Flow (Sail Away) with car sickness for a very long time. After ’95 (which I’ll label as a year of brief relative cuteness), from ’96 – ’99 my head could have easily been a stand-in for Wilson in Cast Away, or alternatively, the Moon. I’m sure there was a disruption with the Earth’s tide cycle during this period. Perhaps I was attempting some kind of distraction trick when I decided to go blonde for the next 4 or so years? While it was fun, I wouldn’t do it again. When you have naturally very dark hair the risk of going orange is high, and the regrowth is difficult and costly to manage. From 2005 on I can see a twinkle of something in my eyes – something laid-back, accepting and comfortable. That was after I took my first ever overseas trip by myself in late 2004. It was the start of something special. In 2007 I dyed my hair dark red which I quite liked but the DIY home kits eventually started making me look a bit daggy so I stripped that out and have pretty much gone natural since. The most recent photo which was taken in October shows me in a fit of laughter in Monterey Bay (California). I won’t deny that I’ve had an excellent year – traveling for most of it had a significant part to play. Time passes by faster and faster so we end up feeling like 365 days is a short time, but it’s not. A lot can be done in that time. If there are things that have passed you by in 2010, make them a priority in 2011. I’ve achieved some of my objectives for 2010, but certainly not all. If you’ve done the same, it doesn’t mean that we’ve failed – it means we have a plan, we have goals and aspirations. And that’s most definitely something to raise a glass of Veuve to. That’s so cool, I wish I had a picture of me each year.. Thanks Esther 🙂 Gareth – it was hard to track down a few years, I admit. But you can do it for your kids!